So it may appear that I made a very summery salad in the dead middle of winter and yes that might be true, but more importantly I made a superfood salad to keep this healthy eating season going. Plus, I happened to have a carton of raspberries to use up so I figured I may was well make a healthy meal versus a sugar packed sweet. 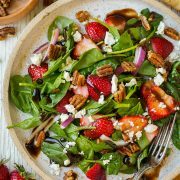 This power salad is seriously loaded to the max with goodness and it really does taste delicious! If I’m counting correctly this has six, yes SIX superfoods. 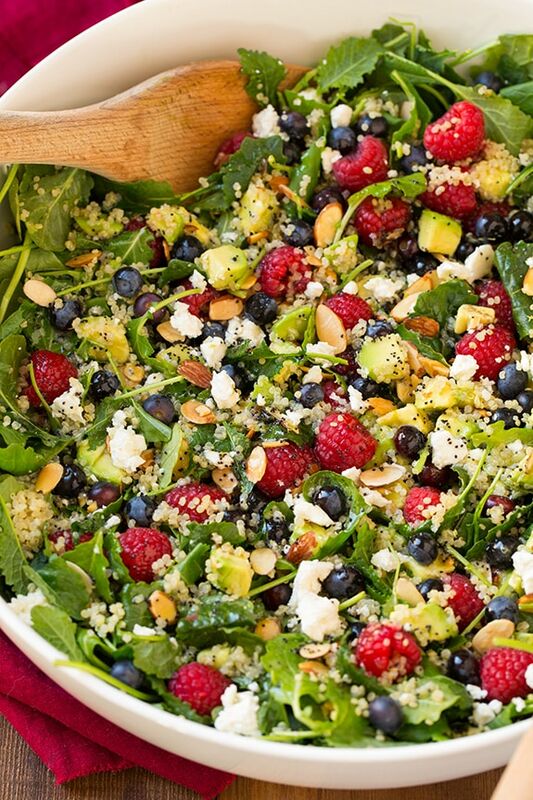 Kale (which I prefer baby kale in salads or smoothies, no harsh bite to it), raspberries, blueberries, avocados, almonds and quinoa. Then some feta for good measure, right? 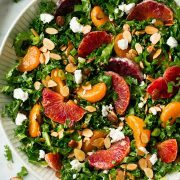 With all the sweetness in the salad it did need a little salty and feta always does the trick. It’s definitely one of my favorite cheeses, plus it’s not as fat heavy as many of the other cheeses out there. If you wanted you could even use a light feta to cut calories. This makes one really big salad so if you are only serving one or two people you could easily half this recipe. Or at least only make one half at a time because the avocados will start to brown and the salad will get soggy if it’s covered in dressing after a not too long. 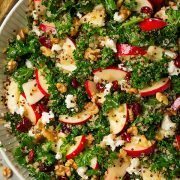 Try it soon though this Berry Avocado Quinoa and Kale Salad with Honey-Lime Poppy Seed Dressing is delicious (for short I also like to call it a Summer Berry Kale Salad with Poppy Seed Dressing – that long title is kind of ridiculous I just wanted you to know all the amazing goodness that’s in it)! Who said healthy eating was always boring? I love to prove that notion wrong. 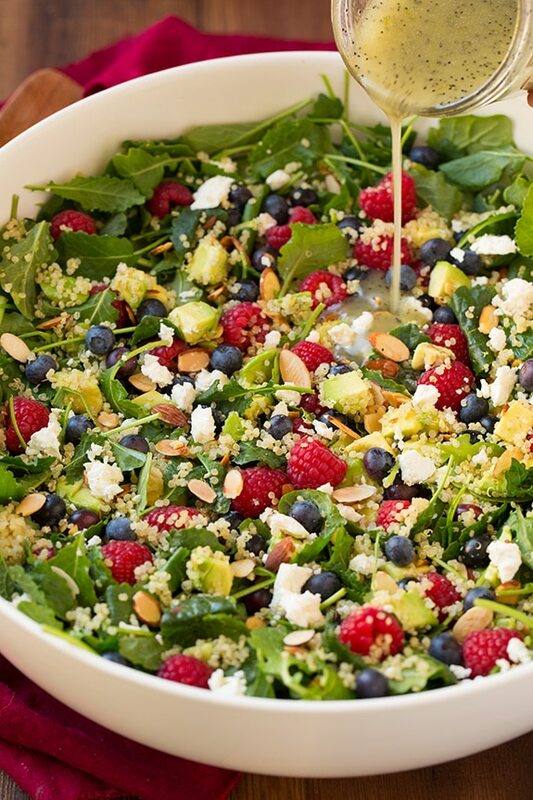 A perfectly enticing salad filled with sweet and refreshing berries, creamy avocado, nutritious quinoa and spinach and tangy feta. In a blender or mason jar combine all dressing ingredients except poppy seeds. Blend until well combined (or cover and shake if using a mason jar). Pour into a container and stir in poppy seeds. Store in refrigerator. 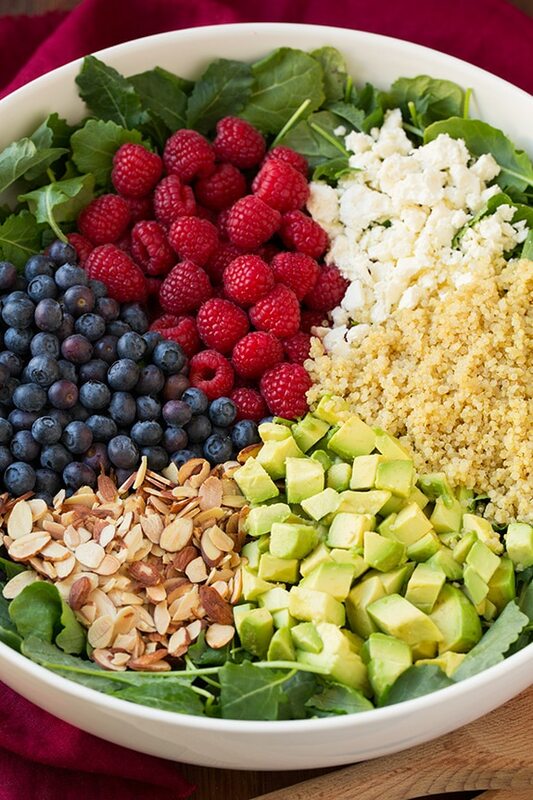 For the salad toss all ingredients together in a large salad bowl. Pour dressing over top and toss. Serve immediately after adding dressing.